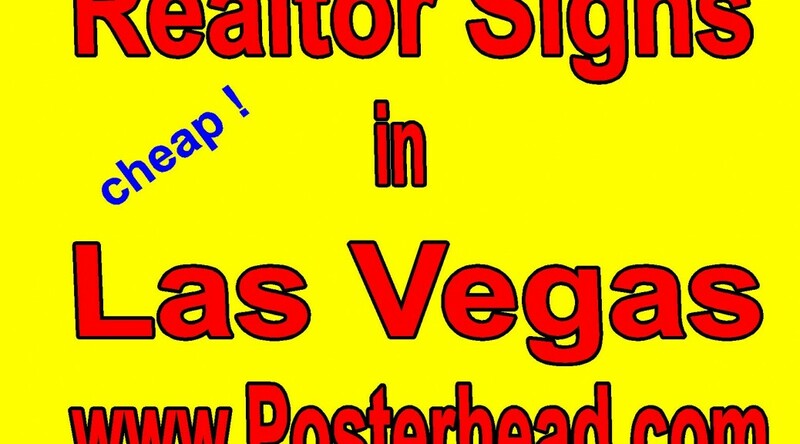 Signs for realtors in Las Vegas are required if you want a successful career in real estate. Studies suggest that a simple real estate sign placed in front of a property for sale is well worth the investment of the sign. At around 10% response rate, ( 10% of the time the sign will drive a sell) and market branding of your name and/or brokerage, a simple $30 real estate sign is well worth the investment. More information of a signs benefit can be found in this article: https://activerain.com/blogsview/5243878/best-tips-on-using-real-estate-signs-to-your-benefit . The real estate market is booming in Las Vegas right now ( July 2018 ). It is being driven by the Californians who want to escape the high taxes of our neighboring state and associated problems. Many listings are selling for more then the asking price of the house because many people are bidding on the same house and having the house appraised for funding is becoming an issue. Realtors are meeting the challenges and houses are being bought and sold quickly. Many agents of the Great Las Vegas realtors Association like to have a sign placed on the property as quickly as possible, because not only are they getting a commission for listing the property for sale, they no historically that a sign alone will lead to another 10% action on the house. if their name is on the sign, there is a strong possibility that potential clients will call them and they will also possibly get the buying commission as well. A 6% commission on a $300,000 home is $18,000 !!! With the average price of a realtor sign around $30.00, you can see how it is a very cost effective way of doing business. In addition, a sign brings people’s awareness to your name and the name of your brokerage for future business. Signs for realtors can be found and produced at sign companies locally.